Driving down to Kraków on Tuesday morning, I stopped by a lay-by in a forest some 55km north of my destination. 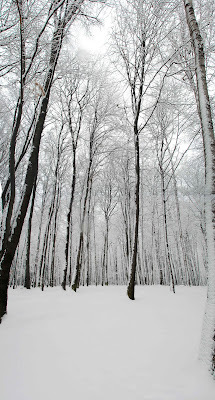 I was lured into the forest by the desire to capture the dream-like winter atmosphere of the scene. All was quiet and still; a few snowflakes fluttered down. the perfect embodiment of going 'Through the Woods' . I can sense the static, alluring, dream-like atmosphere that you mention. I love the elegance curves and skeletal beauty of the trees and their branches, lifting up to the heavens.